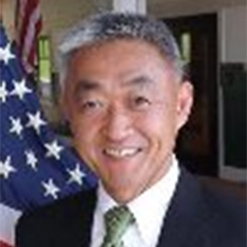 Colonel (Retired) Fredrick S. Choi is an accomplished executive with more than 28 years in the US Army. Prior to arriving in Atlanta, Georgia, Colonel Choi was assigned to US Army, Pacific as the Chief of Operations and Director of Army Aviation. He graduated from the United States Military Academy at West Point in 1986 and was commissioned as a second lieutenant in Field Artillery. Additionally, he has received a Master of Business Administration from Baker University in 2000. During Colonel Choi’s early career, he served in the Third Armored Division as a Field Artillery aerial fire support officer. In 1990, he attended the initial entry rotary wing training and began a career in Army Aviation. Upon completion of the flight school, Colonel Choi was assigned to 1st Squadron (Air), 17th Cavalry, the 82nd Airborne Division’s division cavalry, as the assistant S3 then as the OH-58D Kiowa Warrior Troop Commander preparing for Operation Uphold Democracy in Haiti. Colonel Choi’s key staff assignments include: Aide-de-Camp to Commanding General, US Army Forces Command, S3 of 3rd Squadron, 4th Cavalry and 1st Battalion, 25th Infantry Division in Schofield Barracks, HI, Aviation Task Force S3 in support of Operation JOINT FORGE (Stabilization Force 11) in Bosnia-Herzegovina, Executive Officer to G3, US Army Pacific at Ft Shafter, HI, Deputy Chief of Operations and Director of Training and Exercises Division for the Third US Army/US Army Central/Coalition Forces Land Component Command at Ft McPherson, GA, and Camp Arifjan, Kuwait, in support of Operations IRAQI FREEDOM and ENDURING FREEDOM, Professor of Military Leadership at Clemson University, Director of J34 (Antiterrorism, Force Protection, and Critical Infrastructure Protection Division) in the United Nations Command/Combined Forces Command/United States Forces Korea, and Senior Military Advisor to the Iraqi Army with the 1st Cavalry Division, supporting Operation NEW DAWN in Mosul, Iraq. Colonel Choi’s military decorations include the Defense Superior Service Medal, the Bronze Star Medal (2 awards), the Meritorious Service Medal (5 awards), the Joint Service Commendation Medal, the Army Commendation Medal (2 awards), the Army Aviator Badge, the Senior Parachutist Badge, the Air Assault Badge, and the Saint Michael Medallion. Colonel Choi is married to the former Mary Boyce Tilley and has one son (Nicholas, 22) and one daughter (Anna, 16).